When looking for a special occasion restaurant it’s important to use your loaf. 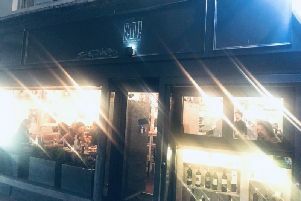 Newcastle has a higher concentration of restaurants at the finer end of dining and Peace & Loaf consistently rises to the top of the pile in lists of the city’s best. It’s a reputation borne out in a string of accolades including two AA rosettes and a mention in the Michelin Guide. If looking for something different to the norm, it has enough of the ‘special’ factor to lure people from outside Newcastle without being intimidatingly so. It’s a little out the way in Jesmond Road – away from the hullabaloo of the suburb’s Osborne Road, thankfully – but has free car parking and is only a 10-minute walk from Jesmond Metro. After a brisk walk from the Metro, I was given a warm welcome at this industrial chic restaurant with its bare brick New York loft apartment style walls which are peppered with a mish mash of artworks and graffiti-style bleeding heart logo. Our table was up on the mezzanine level on a busy Friday night, but if you get a spot on the main floor you can look through to the kitchen as head chef Dave Coulson – he of Masterchef The Professionals fame – and his team get to work. His style is classic British ingredients put together with flair, leading to an inventive menu that offers dishes you won’t find elsewhere in the region with options such as BBQ celeriac, crab apple, date, duck egg and truffle and meatier choices such as lamb with Jerusalem artichoke, tongue, brown shrimp and purslane. Prices on the a la carte menu start at £12 for starters and from £21 for mains, but you get plenty of extras such as fresh bread with the most amazingly rich beef dripping butter and canapés of cheeseburger spring rolls, served in a retro ‘50s diner-style basket, an unusual blend of sinful flavours which I could have devoured until the button on my jeans popped. To start I chose the smoked haddock, black pudding, quail egg topped off with a great Northern sounding cheese pasty sauce (£14). The delicate nuance of the smokey haddock contrasted well with the denser black pudding and the rich, but not sickeningly so, cheese sauce. For mains I chose the John Dory fish with kohlrabi, apple, oyster and eel (£27), which came as a subtle blend of textures of quality ingredients given extra oomph with luscious sauces – all served on a waved, chunky pottery. For stodge, make sure to order the side of triple cooked chips made with beef dripping. Proper honest grub, done well. Front of house didn’t quite match the high quality of the food coming out of the pass. I’d ordered a boozy sorbet for pudding, a signature palate cleanser here, but it was served while I was away from the table, meaning I missed the theatre of her pouring the gin and Prosecco over the sorbet and the ensuing snap, cackle and pop of the popping candy. But it didn’t stop me from enjoying knocking it back with gusto at this restaurant where fine food is made fun.